The town of Mohan at China's border to Laos in South Yunnan is undergoing fast development. The new highway from Kunming to Bangkok runs through this remote part of the Xishuangbanna Dai Autonomous Prefecture and triggers changes geared to facilitate trade. It is projected that 10% of Asia's land transported trade volume will be passing the new highway scheduled for completion in 2008. The border area of Yunnan with Laos is still densely forested. The forests and waterways connect to the rain forests of Laos and together with the wilderness at the Burmese side of the Mekong River form the largest contiguous piece of tropical rainforest of former Indo-China, also called the Golden Triangle. The newly created town of Mohan is surrounded by tropical rain forest. The forest begins right behind the new houses, and more forest will likely be cleared for industrial trade zone development. 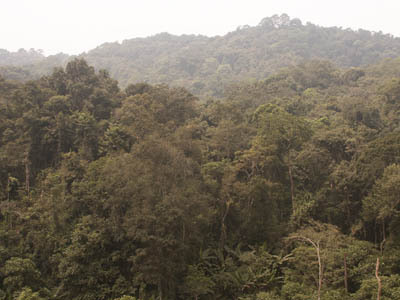 The local Government is concerned with protecting the remaining forests and has tasked the TianZi Biodiversity Centre to design an alternative ecological development plan for a 10 to 20 square kilometer piece of rain forest area adjacent to the town. 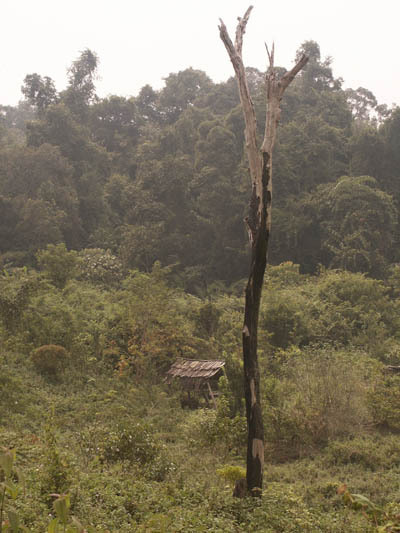 Logging, rubber plantations, agricultural monocultures, and shifting cultivation have fragmented Xishuangbanna's rain forests. It has repeatedly been argued that for maintaining viability of the forests' flora and fauna corridors between the remaining forests for genetic exchange are essential. 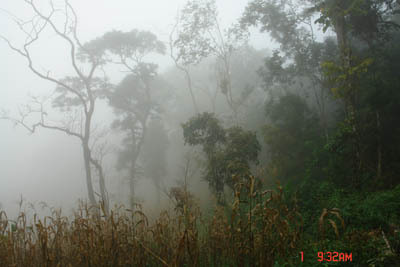 The rain forests of Mohan are directly connected to the forests in Laos. 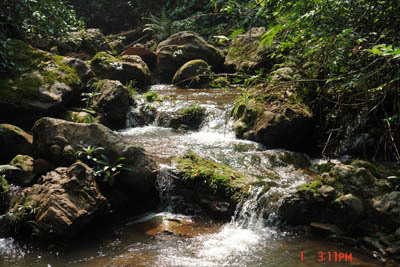 This connection makes the Mohan forests the Northern-most forests of the largest remaining Indo-Chinese forest area. 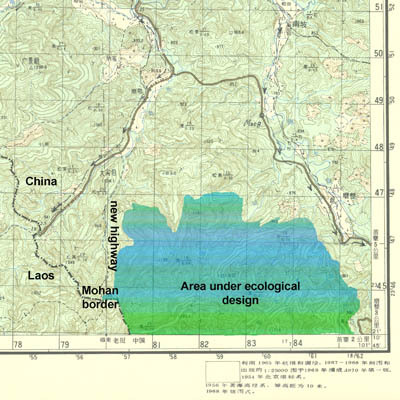 As this area is little studies due to historic reasons, new species are likely to be found in the Mohan area. As a consequence of its bio-geographic importance, any development of the area should be based on principals of sustainability. This encompasses that the flora and fauna of natural ecosystems with their waterways and wetlands are protected. It includes also forms of traditional utilization by the ethnic communities that have visited the area in intervals. 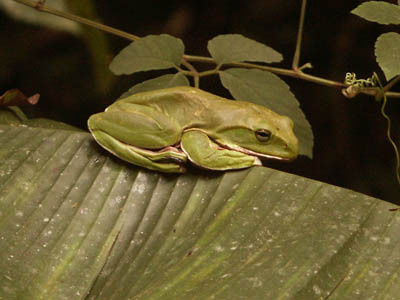 The goal of the rain forest ecological investment project is to combine biodiversity protection with species production. This will be achieved by identifying the potential use of species, find partners for research and product development, and compartmentalize the project area into sub-ecosystems with ecologically adapted management strategies. Mohan is situated at the South end of Xishuangbanna in Yunnan. 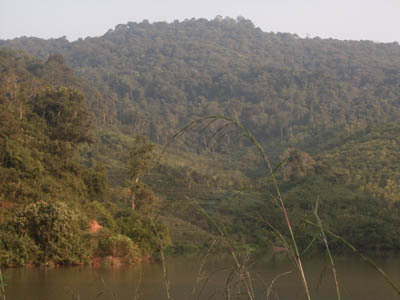 The area under ecological design is bordering Laos along a 10 km borderline. It follows the new highway from Kunming to Bangkok. Several mountain ridges dissect the area in small watersheds. All rivers form tributaries to the Mekong who marks the border between Laos and Myanmar for about 400 km before reaching North Thailand. The entire area is frequently called the Golden Triangle, recently dubbed the 'Quadrangle' with China becoming an active part in its overall development. Map of the project area under ecological design. Further south and along a Southeast running border line, the area extends beyond this map for approximately another 5 to 10 square kilometer. The project area needs to be seen as a sequence of natural sub-ecosystems or compartments, where each compartment is habitat to a different composition of the entire biodiversity. 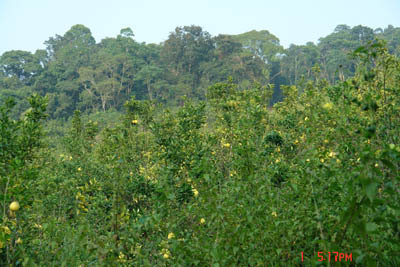 In addition ethnic communities for housing and shifting cultivation have utilized some sub-ecosystems in recent history. Their ancestral land now represents various stages of ecological succession towards a climax forest. 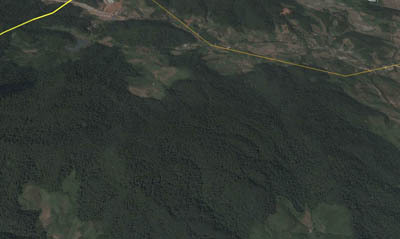 The project area from the satellite: above the new constructions of the border town Mohan; left upper corner: the new highway enters Laos (yellow border line). The entire forested area is available for the ecological development project. The altitude of the project area ranges from 800 meter above sea level near Mohan to usually around 1200 m at the mountain ridges. With altitude, the composition of the forest flora changes notably. Therefore, protection has to include gradients from rivers to the mountaintop in order to cover a wide spectrum of species. The above variations in mind, the project area can be compartmentalized as follows. A man-made lake forms the entrance of the project area close to Mohan town. The lake has been built for landscaping purposes and covers an estimated 10 ha. Its water is slightly salty because the main tributary comes from a hillside with crystalline salt embedded. The lake gives a mesotrophic impression and there is no aquatic vegetation, probably due to its degree of salinity. The lake at the entrance to the project area. The lower part of the mountain in the background is planted to pomelo. Facing toward Mohan, in the hillsides between 800 and 1000 m recent forest clearings can be observed. These, usually small patches, are cultivated by migrating ethnic communities. The present main crop of choice is corn. Shifting cultivation creates open spaces of varying sizes with sufficient sunlight reaching the ground for crops that would otherwise not grow in the forests. Microhabitats include forest edges and canopy gaps, both highly suitable for growing rare aroids, ground orchids, and for establishing useful trees as e.g. Cinnamon. Corn growing in a shifting cultivation plot at about 1000 m altitude. This form of shifting cultivation is difficult to control by the local authorities. The preferred solution is a concept where the ethnic communities are made part of alternative income generating opportunities. Such opportunities can arise from growing natural species, which would otherwise be threatened by genetic isolation and extinction. This will make ethnic communities the keepers of endangered species. Particularly at lower elevations below 1000 m shifting cultivation has been practiced for at least more than 200 years. Indicators of shifting cultivation are large Ficus trees usually on exposed places that may have been used for spiritual ceremonies. Other reminders of former clearings are large Cycas trees, which have grown up in the sunny patches. The ethnic hill folks used their young leaves as vegetable. Nowadays, such Cycas trees are rarely found in nature and tend to end up in horticultural nurseries. In the secondary forest, they will need a light weeding from overtopping vegetation to keep them healthy. 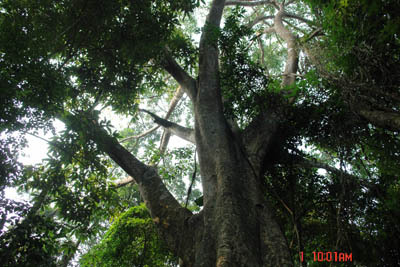 An old Ficus tree in secondary forest is usually a sign for early settlements. In the area where this tree grows, on a small platform at about 1000 m altitude, there has been a Hmong village until about 100 years ago. 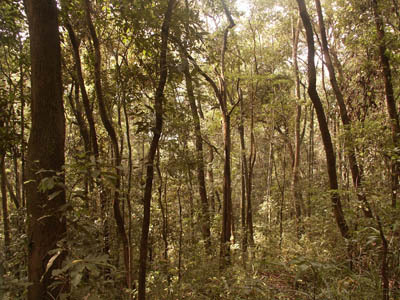 The secondary forests are mainly dominated by pioneer trees and at early stages often overgrown with lianas. It is obvious that the climax species of the original rain forest are either slow in re-establishing in the area, or their seed dispersal agents are no longer present. 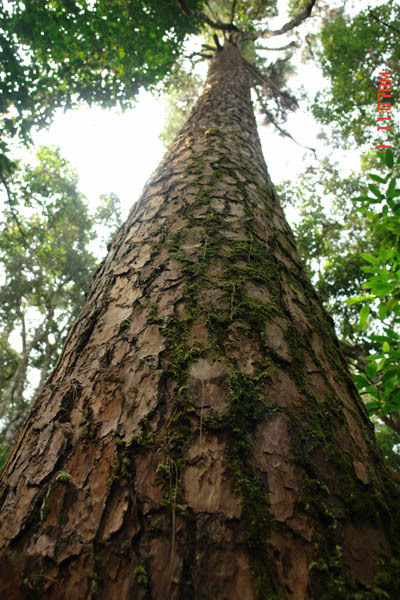 The family of trees, which is characterizing the Asian rain forest – the Dipterocarps – is absent, although they form a larger population just about 50 km further north. The secondary forests deserve research into the speed and species composition of natural regeneration. Most parts can be dated as to their last utilization; hence, valid conclusions for natural regeneration can be drawn. It is likely that active enrichment planting with shade tolerant climax tree species can assist natural regeneration particularly for species which seeds are transported by large birds as e.g. horn bills, and by large mammals as e.g. elephants and monkeys. Simultaneously, the former shifting cultivation areas can be used for growing shade tolerant crops under an ecologically viable and extensive planting scheme. The care for the shade tolerant crops and the enrichment planting with climax tree species needs to be designed to mutually support each other. 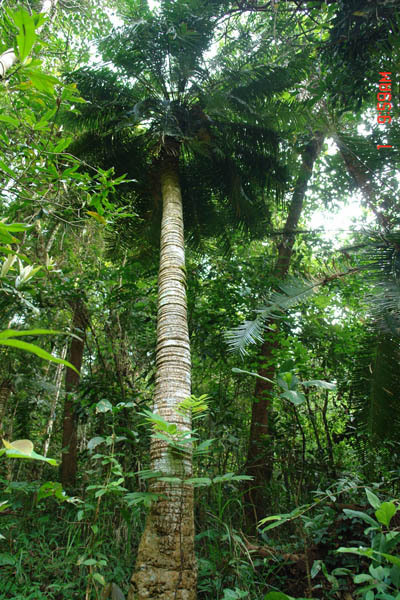 Cycas trees in secondary forest allow a good estimate of the time when the last shifting cultivation cycle ended. The Cycas in the picture has reached about 200 years. Old growth forest at high elevations: the old pine trees indicate a historic forest fire. Above 1000 m the plant community is spontaneously changing into an old-growth forest, which had at least been burnt once about 100 to 200 years ago. Indicators for the forest fire are gigantic pine trees, which are known to have a competitive advantage after fire at the climatically cooler zone of higher altitude. Ridge forest dominated by pines, oaks, and castanias. 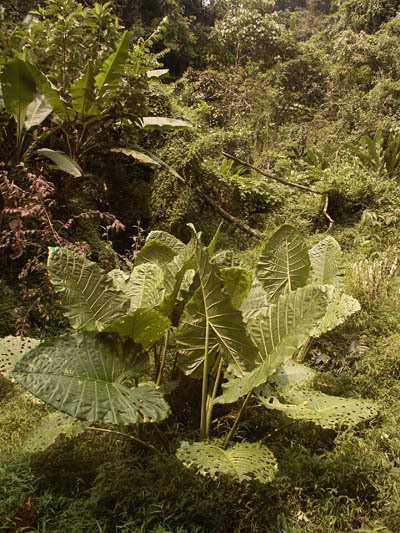 This forest type allows much light to reach the ground where medicinal orchids grow. The forest at this altitude is dominated by old oak trees and other Fagaceae resulting in a crown cover of around 50% only. This forest has reached a near climax state. Due to the comparatively high light intensity on the ground, medicinal ground orchids find a perfect environment. This can be enriched with more orchids from tissue culture for medicinal crop production. This forest can only be reached after crossing the first mountain ridge and it leads into the most fascinating interior valley of the project site. Here are no signs of human disturbance. Wildlife abounds and so do leeches attacking every intruder. This ecosystem should remain the undisturbed core zone of the project. It extends along a transect from about 1200 m to a valley at around 800 m. Hence it provides habitat for several plant and animal communities including a riverine wetland zone in the interior valley. The interior climax rain forest of the Mohan project area. This zone should be under strict protection. A pristine river originates in the interior watershed of the climax forest. The river, its wetlands with flora and fauna deserve strict protection, too. Although there is ongoing extensive grazing by cows and goats of the more flat areas of the valley, this can be controlled by disallowing passage for ruminants. Rare tree frog in the riverine wetlands of the interior valley. Hidden between densely forested mountains is the interior valley of the project area. While most of the valley is covered with riverine jungle vegetation, the upper valley ends in a flat place, which has been used for shifting cultivation just recently. There are old rice fields, some abandoned rain fed cropping areas, and a little shag for shelter. This place would make an excellent research station for ecologically oriented visitors, taxonomists, and travelers who wish to experience an undisturbed rain forest surrounding. The place can be reached from 2 sides: from the lake in a comfortable half day hike over the ridge or on horse back from a village outside the project area, about 11 km away from Mohan. Electricity would have to be solar powered. Spring water is available. The recent clearing in the middle of the interior valley could be transformed into a research station for rain forest studies. It is surrounded on all sides by dense undisturbed forests reaching from the river to the mountaintops. Part of the project area is a 20 ha fruit tree area mainly planted with pomelo. This is an ideal site for growing Dendrobium and Vanda orchids in the short trees. The pomelo area near the forest is an ideal habitat for growing Dendrobium and Vanda species. The Pomelos have reached an age where production and fruit quality decline and alternative uses for the area are welcome. To meet the goal of biodiversity protection and simultaneous income generation including fair trade and improved livelihood for ethnic communities, a comprehensive concept for the ecological development of the project area is envisioned. This concept needs to be based on principals of sustainability to be successful. Therefore, long-term partnership with national and international partners in form of investors and contractors for biodiversity product development is essential. Also private partnership and stewardship are part of the concept. The following ecological development alternatives are possible for the different sub-ecosystems. Located between town and project area, provides hygienic space for various processing of new products. Overview of the sub-ecosystems in the project area and their development potential for private and company investment. Gingers, the family of Zingiberaceae, has its gene centre in Asia. There are more than 100 species, which would be suitable for the climatic and structural conditions in the project area. The most suitable sub-ecosystem is the shifting cultivation and secondary forest area. Here, already at least 8 species of ginger grow naturally. Among them are the medicinally important species Alpinia galanga and Curcuma longa, both probably remnants of earlier cultivation by ethnic communities. 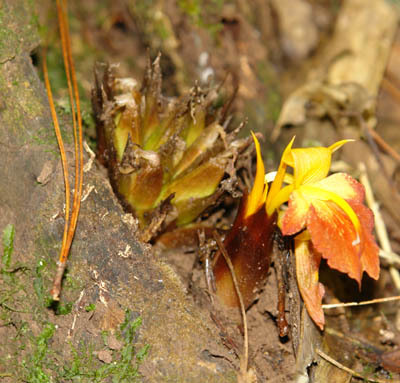 The site can further be enriched with species like Cardamom and newly described aromatic Ammomum species from Xishuangbanna. Galanga ginger is growing naturally in the secondary forest of the project area. Gingers are used traditionally for food and medicine, and some species have excellent aroma in their seeds and leaves, which can be used for essential oils. There are also new ginger species being discovered and their potential for utilization merits scientific research. Further research on site needs to go into the pollination mechanisms for the different species. Most gingers require specific bee species for optimum pollination. As the undisturbed natural forest is within flying distance of these bees, chances for good pollination are high. As enrichment planting with climax rain forest trees is recommended in the shifting cultivation and the secondary forest area, the ginger planting and tree establishment needs to complement each other. 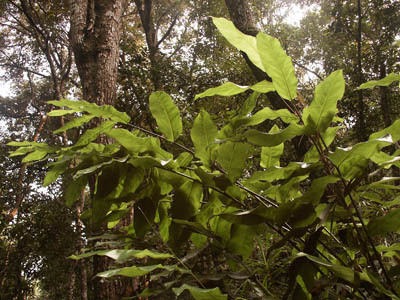 New ginger species found in the ridge forest of the project area. Such species should be protected and research into their potential usefulness, pollination and propagation mechanisms needs to be carried out. Depending on species, orchids require different microclimates and habitats for optimum growth. Many orchid species have traditionally been used as medicine. In recent years, Dendrobium species were the focus of attention for medicinal utilization. However, there are many more genus, which contain valuable ingredients for the medical and cosmetics industry. Last not least, there is still a growing horticultural market mainly for the beautiful hybrids of Vanda and Phalenopsis. In the project area many orchid species are growing naturally. 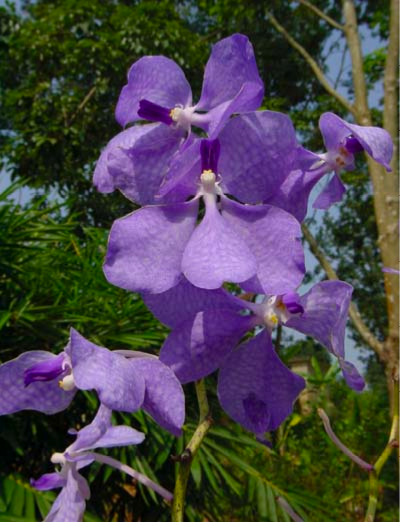 Among them is the famous Vanda coerulea on large old trees. Producing orchids naturally in forest ecosystems has not been tried on larger scale so far. The most suitable sub-ecosystem to start with orchid production is the 20 ha pomelo fruit tree area. In preliminary research TianZi has shown that orchid production, including Vanilla mexicanan and Vanilla siamensis as well as Hygrochilus and Vanda hybrids fruit tree gardens and forest like places can be very successful if the plants are cared for on daily routine to remove pests manually. As the use of pesticides is not ecologically acceptable and furthermore the overall production is thriving for organic certification, daily management is essential for successful production. Vanda coerulea growing naturally in the ridge forest of the project area. The oil melon vine, Hodgsonia macrocarpa, has become very rare. With its large fruits and excellent taste, people have eaten it wherever the fruits were found. 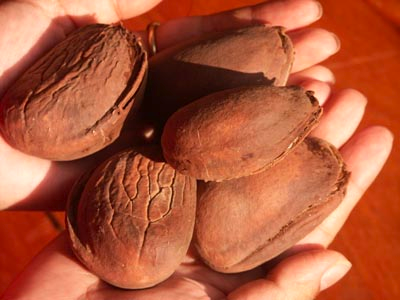 Old folks of the Lahu, an ethnic community of hunters, claim the oily nuts are particularly good for old people. The production of oil melons has been tried many years ago but as the vine is dioecious (separate male and female plants), grows very large (up to 100 meter), and requires trees to grow up, the attempts to make the nuts commercially viable have failed. At TianZi we have researched growing Hodgsonia for several years, and the plant grows well in a secondary forest and orchard environment. Pollination is exclusively performed by a Sphingid moth. It is likely that Hodgsonia can be incorporated successfully into the secondary forest and pomelo fruit tree area. This would be the first plantation of this valuable species. Such, the project concept will have its first example of a traditional food crop that is both protected and produced to ensure its survival. Oil melon nuts are probably the largest nuts known. They are clam shaped and the nut is very tasty, often compared to pork fat, and rich in omega unsaturated fatty acids. The marketing potential of these rare nuts, which will be new on the markets, is very high. Hodgsonia macrocarpa is already growing naturally in the project area. Hence, its enrichment planting will increase the local population until commercial quantities can be harvested. If successful, this new crop will likely be picked up by many marginal farers and hence contribute to the increase of forest cover of the area. Therefore, planting Hodgsonia oil melon can contribute to economic and ecological sustainability. The above examples of ecologically sound integration of biodiversity crops for special rain forest products are only a preliminary selection of existing options. There is a much wider range of plants under investigation and available locally, which deserves attention and can help achieve the goal of the project. Many smaller spots inside the forest ecosystems have special microclimates and are suitable for more species from other plant families as e.g. the large group of Aroids in a canopy gap spot in the middle of the forest. The high value the project area has scientifically for the understanding of the Indo-Chinese forest ecosystems makes it obligatory to welcome scientists from all over the world to study ecological aspects and taxonomy of species. As science reaches from Universities to knowledgeable individuals it is perceivable to design a research facility, which would also be open to students and travelers with a keen interest to learn more about tropical rainforests. Learning from TianZi experience in other places, life style comfort and food, which is closely adapted to the local conditions and which integrates itself into nature by smart waste treatment, new solar voltaic technologies and the like, is attracting a segment of travelers who are able to add value to the environment. This concept markedly differs from mass tourism, which is vastly extracting value from the environment. A healthy life style creates a healthy environment. At TianZi we offer the following forms of investment and cooperation opportunities for the Mohan project area. Researchers and students are welcome to conduct studies at the TianZi Biodiversity Centre and its project sites. Modalities are subject to mutual arrangements. Internships are welcome. TianZi is contract-growing crops for export. Preference is given to crops, which contribute to the protection of biodiversity and/or which can be grown in forest like environments. For all crops we are striving for organic and fair share certification. A contract growing agreement is available on request. For concepts to support scientific travels and ecological life style, TianZi offers an ecological housing scheme. The scheme allows investment into improved local style houses with garden for private use and/or for leasing and renting to travelers for income generation. 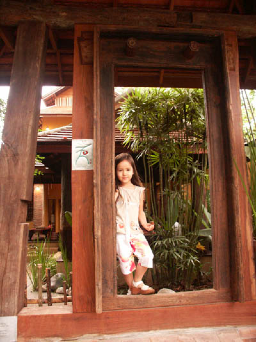 The standard housing scheme encompasses 2 mu (about 1,300 square meter) for a house and garden. The land is situated around the man made lake. The entire project area is private property. Any part of it can either be rented for ecologically friendly biodiversity-crop production as described above, or be sold with use rights for 50 years under the present land ownership law of China. In all cases, be it rent, lease or ownership, the steward of the land can decide to either manage the land according to ecological principals together with TianZi, or opt for complete protection. Land purchased under the 50 years user right of China is eligible for renewal after 50 years and the land can also be sold. Under the present conditions of continued rise of land prices, this is both a good ecological and economic investment. Agamid lizard behaving like a chameleon. 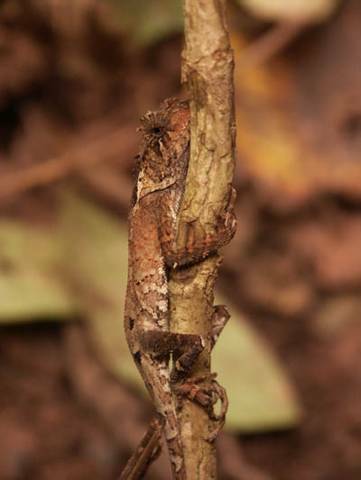 It moves very slowly and relies entirely on its camouflage for protection. Its habitat is close to the river. We offer to take care of individual plants, trees or species that you may wish us to particularly protect. This may be a plant you give to us and we take care of it or it may be a species that lives in our project area and we develop a special care programme around its protection to ensure its survival. Presently, the project area has 2 tigers coming through regularly from the adjacent forests of Laos. It may be the good deer and wild boar population, which is attracting them. But there are also small and endangered species as the agamid Lizard near the river. For the species stewardship investment any plant or animal native to the bio-geographic area of project site may qualify. All stewardship programmes are included in our public relations activities. Wherever meaningful, signboards explain to visitors about the species and their stewards. Novel crops for varied purposes from medicine to food and cosmetics require refined processing equipment in hygienic facilities, manned by skilled workers and monitored by a scientific laboratory. The land to construct such modern processing facility is provided by the local Government. 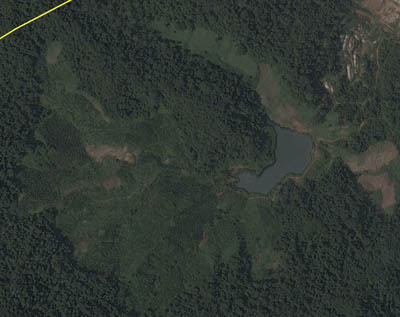 Satellite view of the lake with adjacent fruit tree area connecting to the rain forest. Top right a part of Mohan town, below the future processing area for biodiversity products. TianZi Biodiversity Research & Development Centre Co.Ltd.